Linear regulators are used when a DC power supply is available at a higher voltage than your design requires, and it is capable of supplying all of the DC current you need. They are generally used to clean up problems in the supply you are given; for example, you might have a 12 volt supply that has 100 mV ripple on it, and you need a nine volt signal. A linear regulator will drop three volts (from 12 to 9 volts) and erase most of the ripple (with up to 80 dB rippled rejection!) That drop between input and output is called the overhead voltage. The advantages of linear supplies are that they reject spurious signals and ripple, which could affect the phase noise of your amplifier. The disadvantages of linear regulators are that they are not efficient, in particular, if the overhead voltage and /or idle current is high. If you are dropping 12 volts to 9 volts at 10 amperes current, your regulator is dissipating 30 watts. Heat sinking can be a major concern in linear requlators. There are negative regulators and positive regulators depending on what you are trying to do. 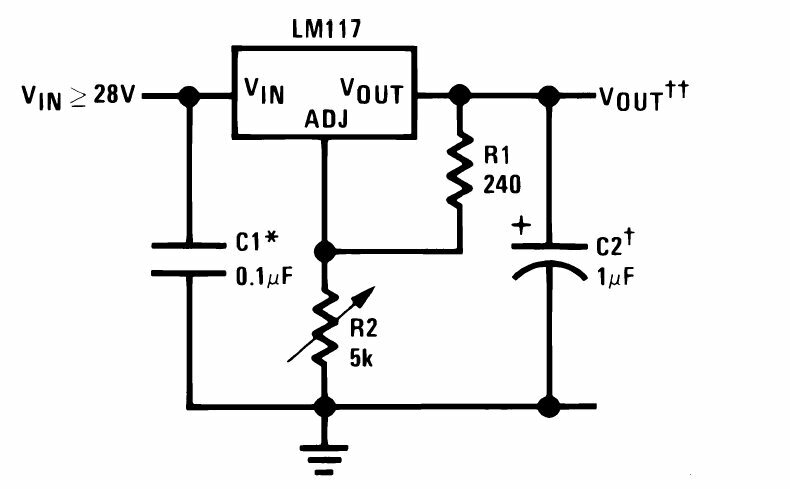 "Classic" linear regulators are the LM117 (LM317 is the commercial version). These date back to when National Semiconductor (founded in 1959) was a powerhouse analog electronics firm. What is left of it was folded into TI. The LM117 can provide 1.5 amps current, with overhead voltage down to 1.2 volts. The dissipation is internally limited so that channel temperature does not exceed 150C (125C on the LM317). The negative regulator version is LM137 (LM337 commercial version). Many linear regulators are thermally-limited. What does internal limiting mean? If you don't know what you are doing, the device overheats, shuts down, cools off and turns back on in, continuing that cycle until you unplug it and redesign your power supply. Low drop-out (LDO) regulators are capable of good ripple rejection with low overhead voltages. This means they can operate more efficiently. An LDO regulator can operate with a little as 0.5V drop, but you have to be careful that the drop allows for maximum ripple on the supply. If you have 0.5 volte peak ripple and use a 0.5V-drop LDO, you must plan on nominally dropping 0.75V. You should at least be familiar with how a linear regulator works. The image below came from data sheet. In this example, the regulator draws 5.2 mA, which is probably a good minimum value. If you increase the idle current, nothing good happens, but you dissipate more power. The two resistors setup the output voltage. In order to get your power supply set to an accurate number, you will have to consider tolerances on the resistors, the Ref voltage, and the ADJ current. Note that linear regulators can be ordered from the factory, with R1 and R2 set up for exact voltages, like 5V and 12V. The dissipation of a linear regulator must be considered, so it does not shut itself off. There are two components: the idle current and the load current, and the overhead voltage. If you want to know when the regulator shuts itself off, you will need to know the thermal resistance. The value that is given in the data sheet assumes you know the temperature of the baseplate that it is mounted to, in real life there will be a temperature rise in the baseplate during operation that might require finite element analysis (FEA) in order to really predict performance. Good thermal engineers are worth their weight in gold. What are those capacitors for? The capacitors provide two functions: the regulator might actually need them for stability, and they improve ripple rejection. Follow the data sheet when it comes to capacitors. Often, you might see parallel combinations of electrolytic and ceramic capacitors, they each have a sweet spot on the frequency spectrum for ripple rejection. In pulsed radar applications, large banks of charge storage capacitors are placed on the output to source the current pulse. Read about that here. When you size the regulator, you only need to consider the average DC current, but keep in mind you will have to idiot proof the transmitter so it never operates continuously. An important consideration when idiot-proofing a regulator circuit is to make sure the output is never held up at a high voltage when the input is turned off. When an application needs charge storage capacitors, this can be a real problem, power supply interuptions can blow the regulator. The solution is to put a protection diode from the output back to the input, that drains the charge storage when the input goes low, or keeps the input close to the output voltage if the input is open-circuited. Regulators are available in a wide variety of plastic and metal packages, just take a look on Digi-Key's web site. What if you want a chip version of a regulator, to drop into a chip-and-wire module? You need to find a supplier that specializes in chip versions of common parts. There is another nuance to using chip versions of parts such as regulators: what is the correct potential to mount the chip on? If you don't consider this, you might just mount a regulator on a metal surface that is at ground potential. In some cases that can cause problems. When dealing with common silicon integrated circuits in chip form, mount the device on the most negative potential of its ports, or ground if it is more negative. Thus, for a negative regulator, you should mount it on a surface that is connected to VIN. For a positive regulator, ground the backside. Like all rules of thumb, don't stake your career on it, do some research, there are always exceptions to the rule!